The broad winged hawk is a summertime bird in Sutton Massachusetts - in the winter it flies all the way down to Costa Rica and South America in order to vacation! 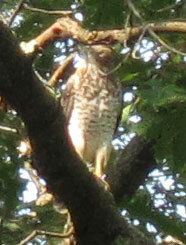 This hawk is sometimes seen high in trees in back yards, watching for birds and mammals to munch on. 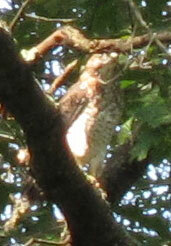 It also can be spotted soaring on the thermals high overhead. 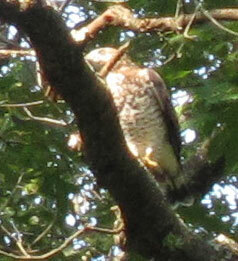 Known in Latin as Buteo platypterus, the broad-winged hawk has brown wings. 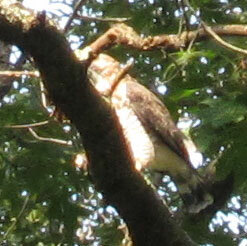 Its chest is layered with thin brown stripes and white stripes. Its tail has stripes of dark brown and white. Its face has a typical curved hawk beak. When they migrate they travel about 4,000 miles to reach their destination, going about 70 miles each day. That's about a 2 month trip. They tend to travel in large groups. 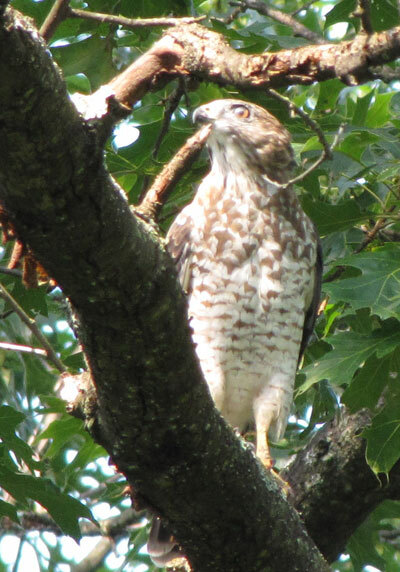 We've seen the broad winged hawk several times in our back yard, and once I was nearly hit by one as it chased a smaller bird right down my lawn at top speed. If you have a pet cat, I'd keep it inside in the summer!